The increase in the elderly population today is a fact. This group of people needs day-to-day care due to their age and, in addition, they often have health problems. Technology can be used to mitigate these problem. However, it must be beared in mind that most of this population is currently unable to get the most out of electronic devices. To help elders benefit from these devices systems adapted to their needs and preferences are needed. In particular, systems that use the elders contextual information to integrate several aspects of eldercare and adapt them to each elder would provide significant benefits. 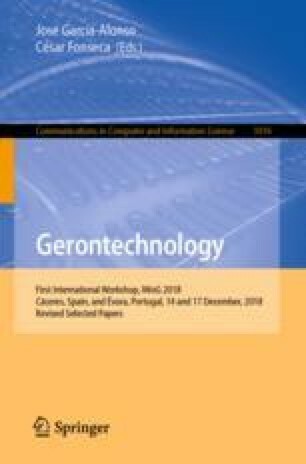 In this paper, we propose to use smartphones as the device who centralizes contextual information of the elders, focusing on emotion recognition. These emotions will be used to recognize to what extent an elderly person needs care at certain times of the day and to adapt surrounding IoT systems to their needs and moods. This work was supported by 4IE project (0045-4IE-4-P) funded by the Interreg V-A España-Portugal (POCTEP) 2014–2020 program, by the Spanish Ministry of Economy, Industry and Competitiveness (TIN2014-53986-REDT and TIN2015-69957-R (MINECO/FEDER)), by the Department of Economy and Infrastructure of the Government of Extremadura (GR15098), and by the European Regional Development Fund.